A new Baby Girl has arrived! What better way to welcome this bundle of cuteness than with an InterGift Baby Girl Hamper, filled with beautiful gifts? Keep Baby entertained with the teddy bear finger puppet blankie. In baby pink coloured super soft fabric with striped edge and underside. 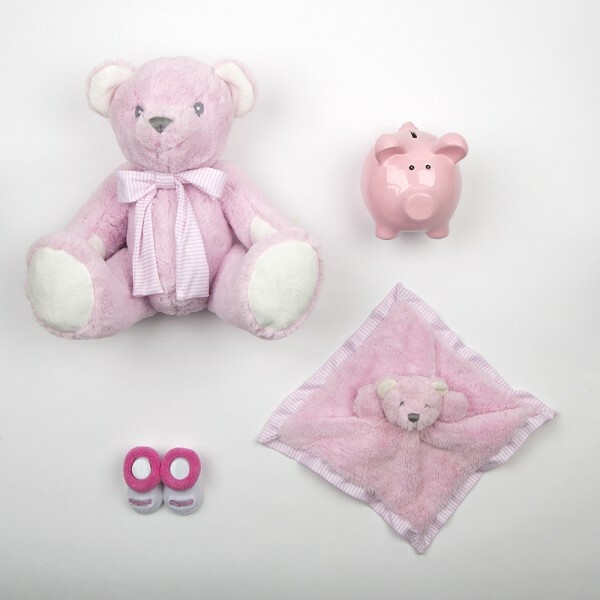 There’s a large super soft traditional pink teddy bear with white inner ears and pads. She has a lovely smile and wears a blue and white striped cotton bow. Perfect for cuddles! She’s gorgeous from head-to-toe so these ‘Gorgeous’ socks will suit her perfectly and keep little toes cosy. An InterGift New Baby Girl postcard will be added to the hamper with your personal message on the reverse.